Just landed in Bulgaria? Welcome! Don’t waste a minute at the airport waiting for taxis. Book your Airport Transfer with us – that’s the quickest, easiest and budget way to reach your destination. Arrive in Comfort. On Time. On Budget. SofiaAirportTransfer is a reliable, safe Airport Transfer and private Door-to-Door Service to provide timely, comfortable transportation to and from any airport, hotel and resort throughout Bulgaria – at LOWEST LOCAL RATE. The quoted prices are for one way trip only. You will be awaited at the arrivals gate, hotel lobby or address by one of our chauffeurs, ready to help you with your luggage, and drive you smoothly and safely to your destination. Look for your driver holding a board with your name at the arrivals gate usually 20 minutes after landing. Operating a wide range of comfortable vehicles including standard cars, minivans, minibuses, buses, and limousines, we can accommodate all your requests. Our fleet comply with all the relevant legislation and insurance requirements. All vehicles are equipped with snow tyres and chains and have ample space for your luggage and equipment. Baby/child seat is provided for free. Our courteous English speaking drivers are highly professional and well aware of the traffic, infrastructure and road conditions in the country. We pride ourselves on having friendly staff who will do their best to make your transfer pleasant and comfortable. With vehicles based in Sofia, Bansko, Plovdiv, and partners in all major Bulgarian resorts, we are able to offer great flexibility in case of force major circumstances and hard winter conditions. Taking you to your destination safely, on time is our top priority! SofiaAirportTransfer is open for bookings 24/7. You can order your transfer online by simply fill-in our BOOKING FORM or by telephone on +359 878 208700. Our agent shall send you a binding booking confirmation via e-mail. If you do not receive our response within 24 hours, please give us a call or email at info@sofiaairporttransfer.com. The price quoted is the price you pay, there are NO hidden fees for flight delays, overnight trips, luggage, tolls, fuel! All rates are quoted in EUR. You can pay simply in cash direct to your driver upon arrival at the destination or you can prepay by PayPal. Private transfers will get you to your hotel or accommodation quickly and hassle free. The perfect option for families with children, travelling with extra luggage. 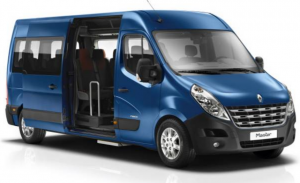 The most budget option for large families or group of friends travelling together, providing space for luggage and ski equipment. The most budget option for large group of friends travelling together, providing extra space for luggage and ski equipment. Book a chauffeured limousine service for a stylish way to arrive at your business meeting or event.